Antares Rocket Explodes Shortly After Launch. There’s numerous stories about the heydays of rocket engineering, when humanity was toying around with a newfound power that we had little understanding of. People who lived near NASA’s test rocket ranges reported that they’d often wait for a launch and the inevitable fireball that would soon follow. Today launching things into space is a well understood territory and catastrophic failures are few and far between. Still when you’re putting several thousand tons worth of kerosene and oxygen together then putting a match to them there’s still the possibility that things will go wrong and, unfortunately for a lot of people, something did with the latest launch of the Orbital Sciences Antares rocket. The mission that it was launching was CRS Orb-3, the third resupply mission to the International Space Station using Orbital Sciences Cygnus craft. The main payload consisted mostly of supplies for the ISS including food, water, spare parts and science experiments. Ancillary payloads included a test version of the Akryd satellites that Planetary Resources are planning to use to scout near Earth asteroids for mining and a bunch of nano Earth observation satellites by Planet Labs. The loss of this craft, whilst likely insured against loss of this nature, means that all of these projects will have their timelines set back significantly as the next Antares launch isn’t planned until sometime next year. NASA and Orbital Sciences haven’t released any information yet about what caused the crash however from the video footage it appears that the malfunction started in the engines. The Antares rocket uses a modified version of the Russian AJ-26 engine who’s base design dates back to the 1960s when it was slated for use in the Russian Moon shot mission. The age of the design isn’t an inherently bad thing, as Orbital Sciences have shown the rockets were quite capable of putting things into orbit 4 times in the past, however the fact that Antares is the only rocket to use them does pose some concerns. The manufacturer of the engines have denied that their engines were to blame, citing that it was heavily modified by Aerojet prior to being used, however it’s still probably too early to rule anything in or out. One thing I’ve seen some people pick up on is the “Engines at 108%” as an indication of their impending doom. The above 100% ratings typically come from the initial design specifications which aim to meet a certain power threshold. Many engines exceed this when they’re finally constructed and thus any power generated above the designed maximum is designated in this fashion. For most engines this isn’t a problem, the Shuttle routinely ran it’s engines at 110% during the initial stages of takeoff, so them being throttled over 100% during the ascent stage likely wasn’t an issue for the engines. We’ll know more when NASA and Orbital Sciences release the telemetry however. Hopefully both Orbital Sciences and NASA can narrow down the cause of this crash quickly so it doesn’t affect any of the future CRS launches. Things like this are never good for the companies involved, especially when the launch system only has a handful of launches under its belt. The next few weeks will be telling for all involved as failures of this nature are rarely due to a single thing and are typically a culmination of a multitude of different factors leading up to the unfortunate, explosive demise of the craft. It did make for a pretty decent light show, though. Antares A-ONE Launches, Becomes the Aldrin of Private Launch Systems. It’s hard for me to hide my fan boy nature when it comes to private space flight. Whilst all credit must go to Scaled Composites and Virgin Galactic for getting me inspired about all things space they have unfortunately taken a second seat to my current space crush. Not-so-long time readers will know that I’m talking about SpaceX, a company that has shown time and time again that they’re capable of not only developing technology that no private entity had previously but also delivering on their patently crazy promises. However I’m not in favour of monopolies/single points of failure (stemming from my capitalistic/engineering nature respectively) and the more options we have available to us for putting things in space the better. Today it appears we have another contender: the Orbital Science’s Antares rocket. Now I’ve only mentioned Orbital Sciences briefly in the past, noting that they won a contract to provide launch capabilities to NASA alongside SpaceX as part of the Commercial Orbital Transportation Services (COTS) program, but their legacy stretches back quite a long way. Founded in 1982 they’ve developed several different launch platforms in tandem with NASA and have also been involved in numerous high profile scientific missions. Most recently they developed the Dawn craft which is currently in the asteroid belt transiting from the asteroid Vesta to the dwarf planet Ceres. Needless to say if anyone has the chops to develop their own launch system it’s orbital sciences and the Antares rocket is their first such system. On paper it looks to be somewhere between the Falcon 1 and 9 with a total payload to LEO of around 5000kg. The two first stage engines are curious little beasts, originally designed to form the basis of the Russian N-1 rocket that was bound for the moon. Considering that launch system was a dismal failure you’d then have to wonder about them using the engines from it but N-1’s issues were mostly process/design based rather than stemming from issues from one particular component. It also has a slightly wider payload fairing than the Falcon 9 at 3.9m in diameter which could come in handy for certain mission profiles. 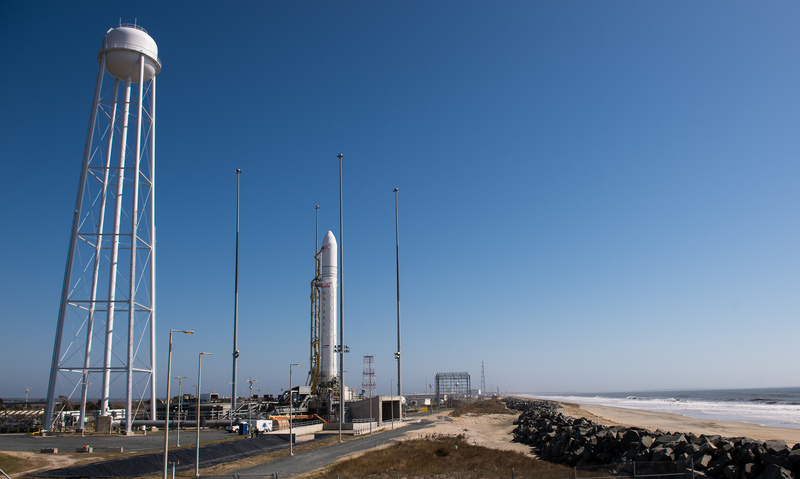 The first launch of the Antares (dubbed A-ONE) was scheduled to happen in the middle of last week however some minor technical issues delayed the launch. The rocket itself was fine however one of the umbilical cables disconnected 12 minutes prior to launch, far too early when it usually happens right before lift off. Thankfully this didn’t require the rocket to be stood down and they were able to reschedule it for a couple days later. Unfortunately high winds on the second launch day caused them to issue a no-go due to weather and it was rescheduled for today. Thankfully conditions improved and they were able to launch, making the Antares rocket the second fully private rocket to make it to orbit. Apart from that it’s still notable for many reasons. If the picture above looks a little unfamiliar to you it’s because the Antares wasn’t launched from the iconic Cape Canaveral. Instead it was launched from NASA’s Wallops Flight Facility located in Virginia, a place that doesn’t usually see rockets of this size. Indeed the Antares rocket is the largest rocket to ever be launched from this facility and will likely become the defacto launch site for the rocket in the future thanks to its much less crowded launch schedule. If all goes to plan this site could see another 2 launches of the Antares rocket this year which would be on par with SpaceX’s rapid turnaround times. Today marks a great achievement for Orbital Sciences and the greater space industry as it shows that not only is the private space industry viable, it can likely support several competing players. This will only help spur innovation forward as companies look to outpace each other on every aspect. Whilst SpaceX might be the current starlet Orbital Sciences has decades of experience behind them and I can’t imagine them being in the backseat for very long. As always this means that the cost to launch will trend downwards and from there it’s only a matter of time before it reaches the commodity level. And that, my friends, is really exciting.